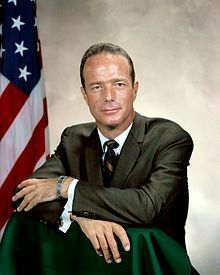 Malcolm Scott Carpenter (May 1, 1925 – October 10, 2013) was an American test pilot, astronaut, and aquanaut. He was one of the original seven astronauts selected for NASA's Project Mercury in April 1959. Carpenter was the second American to orbit the Earth and the fourth American in space, following Alan Shepard, Gus Grissom, and John Glenn. Carpenter had a stroke and entered The Denver Hospice Inpatient Care Center at Lowry, Denver, Colorado where he died on October 10, 2013. He was 88 years old. ↑ 40th Anniversary of the Mercury 7 Retrieved August 29, 2008. ↑ "Boulder astronaut Scott Carpenter dies at 88: 'He wanted to be the best'". Daily Camera.com. Retrieved November 16, 2013. ↑ "Scott Carpenter, Mercury Astronaut Who Orbited Earth, Dies at 88". NY Times. Retrieved October 10, 2013.